Objective of the Device: The Ovesco OTSC clip (Ovesco Endoscopy AG, Tubingen, Germany) has been approved by the FDA (December 2010) for the treatment of gastrointestinal hemorrhage and closure of defects in gastrointestinal organs. Description of the Technology and Method of its Use or Application: The OTSC is a novel endoscopic clip application system with a nitinol clip mounted on a clear distal cap at the end of an endoscope. The clip is deployed by turning a wheel on the shaft of the endoscope. It has been reported to have superior apposition and closure properties compared to existing endoscopic clips, and may provide definitive treatment for a variety of defects in the gastrointestinal tract, including perforations, fistulae and surgical incisions. Clips are produced in three varieties (large teeth, small teeth, no teeth) and three sizes (11mm, 12mm and 14mm in diameter). The strength of closure and maximum diameter of closure for a single OTSC clip are unknown. Prior studies have documented closure pressures (“burst pressures”) for closures of gastrotomy sites, using standard available techniques. These subcentimeter incisions, dilated with an 18mm dilation balloon, achieved a mean “burst pressure” ranging from 48.4mmHg for endoscopic clips (4-5 clips) to 64.6mmHg for surgical stapling and 81.8mmHg for double-layer manual suturing (Ryou M, Fong DG, Pai RD, Rattner DW, Thompson CC. Endoscopy. 2008; 40: 432-436). 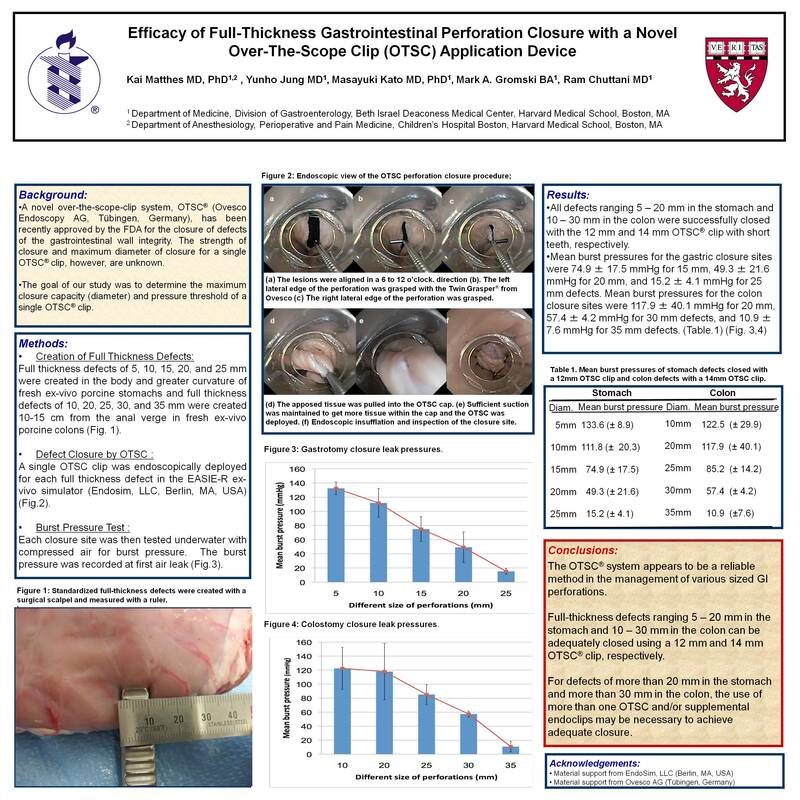 The goal of our study is to determine the maximum closure capacity (diameter) and pressure threshold for a single OTSC clip.Preliminary Results: Full thickness defects in the body and greater curvature of fresh, ex-vivo porcine stomachs were repaired using the OTSC clip system (12mm diameter, large tooth clip). Linear defects of various sizes were created (5mm, 10mm, 15mm, 20mm, 25mm, 30mm). Five defects of each size were closed using the OTSC clip. For defects ranging 5-25mm, all clips achieved successful closure, with no remaining defect on endoscopic inspection and endoscopic insufflations were maintained. The 30mm defects were not successfully closed with a single OTSC clip. Each closure site was then tested underwater with compressed air for burst pressure, as previously described by Ryou et al. Mean burst pressures for the closure sites (± standard deviation) were as follows: 132±10mmHg for 5mm defects; 112±20mmHg for 10mm defects; 71±24mmHg for 15mm defects; 49±22mmHg for 20mm defects; 15±4mmHg for 25mm defects. There were three scenarios (5mm and 10mm) where native porcine stomach tissue burst before the clip (pressures recorded at instance of tissue rupture). Conclusions/Future Directions: The Ovesco OTSC system successfully closed full-thickness gastric defects from 5mm-25mm. Perforations larger then 25mm may require more than one OTSC to achieve sufficient closure. Closures of 15mm defects sustained a mean pressure that was superior to surgical stapling of similar lesions in historical data (Ryou et al). Closures of defects 20mm large had a pressure that was slightly better than closure with 4-5 endoscopic clips of similar lesions in historical data (Ryou et al). Our next step is to study the closure size and burst pressures for perforations in the colon using the OTSC.